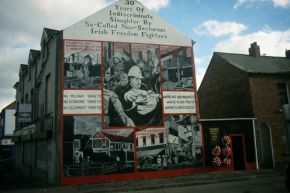 Much has been written about the history of the Troubles in Northern Ireland, but one story remains untold: that of the grassroots activism that maintained local communities in the face of violence. This book speaks through the voices of the activists themselves, drawn from both sides of a divided society. It records their memories of community organising and work on social issues, as well as their insights into surviving the politics of the period and contributing to peacebuilding. Providing a vivid account of how politics touched people’s lives, the book celebrates the energy, imagination and determination of community activism. It also examines the challenges faced by policymakers struggling to make sense of con icting community narratives and o cial government positions. There are vital lessons here for organisers, activists and policymakers working in any contested society, particularly those operating at the interface between social need and peacebuilding. Informed by an oral history approach, this book argues that con ict transformation is possible and that community activism has a major contribution to make in creating alternatives to violence.